Ok, let's get this out of the way right away. Mr. Jalen Johnson, how would you rank your one-handed dunk in the first half off a lob pass from James Graham? "Well, I've been dunking since the sixth grade so ... 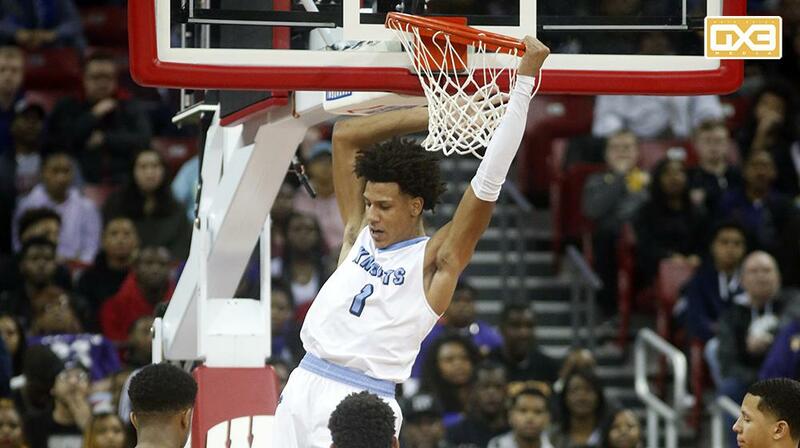 I guess I would rank it among my top five dunks," Johnson said in the media room, following Nicolet's convincing 67-54 win over Milwaukee Washington in the WIAA Division 2 state-title game Saturday night at the Kohl Center in Madison. To which, Nicolet coach Allan Hanson responded, "Top five? Top five? I'd love to see the other four. That was an incredible dunk." Johnson's memorable dunk -- easily the most impressive play of the contest -- had the crowd buzzing as he somehow caught the pass with one hand and then followed through with a thunderous dunk to give Nicolet a 14-4 lead with 12:03 left in the opening half. While Washington, which ended the season with a 22-6 record, battled until the end, Nicolet remained in control the rest of the way and never lost its lead. Johnson, a top 10 recruit nationally in the class of 2020, finished the contest with 20 points, 20 rebounds, 4 assists and 10 fouls drawn. His running mate on the frontline and at times in the backcourt, 6-foot-9 junior Jamari Sibley, added 23 points and 9 rebounds as Nicolet won its first state championship in boys' basketball and finished the season with a 27-1 record. "I think I get kind of spoiled as their coach at times," Hanson said. "To see how excited these guys get when one makes a great play, it's just awesome. I don't know how in the heck Jalen caught that ball on his dunk. He's an unbelievable player, athlete and kid." Nicolet entered the season as the team to beat in Division 2, particularly after the arrival of Johnson, his younger brother, Kobe, and Graham from different schools. The Johnsons moved from Sun Prairie to the Nicolet district while Graham opted to transfer to Nicolet from University School of Milwaukee. Those three joined a very strong nucleus that included Sibley and senior guard Sonny Phinisee. "It was kind of a cool experience to have the target on our back all season," Jalen Johnson said. "It made us work a lot harder to get to where we are today." The presence of Jalen Johnson and Sibley, both at 6-9, made things difficult for Washington sophomore Michael Foster Jr. (6-10) to score in the lane. Foster finished with 13 points and 8 rebounds, but was able to establish a consistent scoring game in the post. "The main thing today was not to be out-toughed and to be tough on the boards," Sibley said. Milwaukee Washington coach Freddie Riley agreed the length of Johnson and Sibley made it difficult for the Purgolders to score at a consistent level. "When you look at the overall length of Nicolet, it can present some problems," Riley said. "They did a nice job with their help defense and their length gave us some trouble. It made it hard for us to dominate in the inside like we do in most games." Senior Deontay Long (6-5), making his third straight appearance at the WIAA State Tournament, had a very strong outing for Washington as he finished with 24 points, 11 rebounds and 2 assists. He accomplished those impressive stats while attacking the basket off the dribble and usually encountering one of the Nicolet Twin Towers near the basket. "What made it more hard today for me was me being out of shape and them being quick off their feet," Long said. "I needed to use a couple of extra head fakes and I also passed out of the lane a few times." Kobe Johnson (6-3) finished with 8 points, 4 assists and 2 steals for Nicolet as the promising sophomore lead guard continues to make impressive strides in his game. With both Johnsons, Sibley and Graham, who had 8 points and 5 rebounds, all expected to return next season, Nicolet most definitely enters the 2019-20 campaign as the team to beat once again in Division 2.